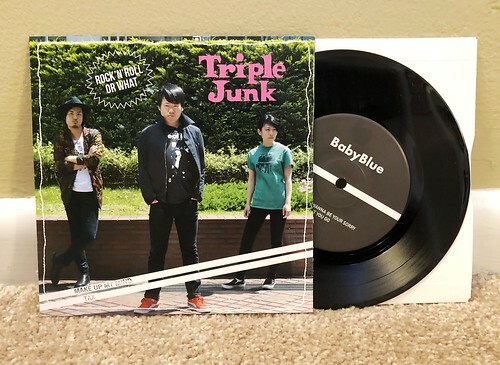 I Buy Way Too Many Records Dot Com: Baby Blue / Triple Junk - Split 7"
I picked up this split 7" as I really loved a Triple Junk 7" I bought last year. Once a band like that gets their hooks in me, I'm always going to try to hunt down other records if I can find them. Luckily I had some help acquiring this one. We'll start off with Baby Blue as they are a band I hadn't heard of prior to this 7", Their first song, "I Don't Wanna Be Your Sorry" is a mid tempo crunchy rock and roll song. It reminds me a little bit of Blew for some reason, but with a much, much more prominent 60s rock flair to them. The lead guitar solo in the middle is a little ridiculous, but it's a solid song. "I Can't Let You Go" takes things down a notch and has a much more melodic feel to it. I'm usually the sort that prefers the faster songs, but this time out the slower one gets my vote. Triple Junk was the band I bought this 7" for and their songs do not disappoint. I still think that they have a slight Gentleman Jesse feel to them, but if Jesse's songs were filtered through a band like Three Minute Movie. "Make Up My Mind" has a slick verse built off of hanging guitar chords and bass guitar. When the chorus kicks in is where this song shines. Their 2nd contribution "Tax" has a bouncier feel to it with a choppy guitar driven verse and a hooky chorus that wouldn't be out of place on an early Weezer record.